Manish Sisodia's elevation as Delhi CM would set Arvind Kejriwal free to take up a significant role in national politics or he could return to activism, says Sudhir Bisht. The drubbing of the Aam Aadmi Party candidate in the Rajouri Garden assembly by-poll in Delhi last week didn't surprise me at all. Voters in this constituency had voted for AAP candidate Jarnail Singh in the February 2015 election. Singh had, in April 2009, hurled a shoe at then home minister P Chidambaram during a press conference. It was very magnanimous of Chidambaram not to have pressed charges against Singh. Had he done so, Singh would perhaps have been convicted and disbarred from contesting elections for five years. Singh threw away his membership of the Delhi assembly to contest from Lambi in Punjab against then chief minister Parkash Singh Badal in the recent state election. He came third in the contest. His exit necessitated the by-election in Rajouri Garden. AAP candidate Harjeet Singh finished a poor third and lost his deposit. The Bharatiya Janata Party candidate won the election, sending Delhi BJP chief Manoj Tiwari's stock skyrocketing. While it is true that one swallow does not make a summer, it certainly is a sign that the BJP has recovered much ground after the thrashing it received at AAP's hands in 2015. With the Municipal Corporation of Delhi election coming up later this month, people forecast a huge victory for the BJP and AAP's decimation. The Congress seems to generate no interest at all. The BJP's campaign theme for the corporation election is again built around its sole vote gatherer, Prime Minister Narendra Modi. The party seeks votes in the name of its tallest leader in the election to the Delhi civic body that is tasked with cleaning the capital's roads and unclogging its drains. The MCD election should not be fought on ideological lines. After all, cleanliness of the city, the running of a few primary hospitals and schools are purely administrative jobs. Delhi's corporators have to ensure that municipality workers in their wards do their jobs well. And yet the importance being attached to the MCD election is far more than it deserves. Political analysts feel the MCD election results will be a referendum on the AAP government's performance. I find this argument somewhat strange. The AAP's rule in Delhi so far has not been spectacular, but it is not dismal either. It managed to keep the water charges at the lowest levels ever. It is true that the timings of water supply have been reduced, but the public has to reduce wastage and make do with reduced supply as water gets distributed more democratically over a much larger area. The Delhi Jal Board today is better run than ever before. The AAP government has not allowed the private electricity distribution companies to hike electricity rates and this indeed is creditable. The government has also succeeded in ensuring that private schools in Delhi don't hike school fees. In fact, private schools have to seek the Delhi government's approval before increasing the school fees. In terms of health management, it is widely believed that the AAP government's Mohalla Clinic scheme has the potential to be a game-changer. It faces issues in implementation, but there is no denying the project's novelty. If everything that the AAP government is doing is good as I say, why are the people of Delhi turning against it? Twenty-six months ago, Arvind Kejriwal and his party demolished the BJP and Congress in Delhi. Why is the AAP slated to bite the electoral dust so soon, and that too badly? The answer to this lies in the behaviour of the man who is beyond a shadow of doubt, the father of AAP. Arvind Kejriwal, the perennial activist, has proved to be a bad leader. He is still incorruptible. Even the Shunglu Committee report has not produced any substantive charges of corruption against the Delhi government. The Shunglu report mentions irregularities and subversion of rules, but that could be attributed to the activist leader's restiveness to get the job done quickly, without much ado about standard operating procedures. The charges of nepotism appear to be true, but I dare say that the magnitude of nepotism does not call for a public beheading, yet. The main problem with Kejriwal is that he seems to be a man who cannot bow before anyone in transforming his vision for Delhi's progress into reality. He knows that Delhi's chief minister and his council of ministers can't achieve much if the lieutenant governor does not approve their proposals. And yet he indulges in a public show of disdain for the LG. He battled with then lieutenant governor Najeeb Jung and always complained about not getting any cooperation from the LG's office. There is a huge gap between what Kejriwal does and what he expects in return. If the mohalla clinics don't get the LG's support, then what should the CM do? The practical approach should be to do everything possible to win the LG's support. When Shiela Dikshit was Delhi CM, she was able to get all the support from then PM Atal Bihari Vajpayee. This is because she always met Vajpayee as Delhi CM and not as a CM from the Congress. Through gentle persuasion, she secured all the support from a PM who belonged to the BJP, but acted in his capacity as the prime minister of the country. What prevents Kejriwal from leaving his ego behind and obtaining the LG's required approvals? During the polls, he had promised to regularise the jobs of hundreds of temporary and contractual teachers. And he did move forward in that direction. But his proposal appears to be stuck at one office or the other. Why does he not ensure that the proposals are cleared expeditiously? The poorly paid temporary teachers have started to lose their patience. To them, Kejriwal too is one of those politicians who is ever ready to promise, but equally at ease to renege on promises made. Not only is Kejriwal unable to work with the LG with whom he has a direct working relationship, he seems keen to pick up quarrels with anyone who matters. Remember how belligerently he tried to malign Finance Minister Arun Jaitley? And he wasn't fighting Jaitley for funds, but slamming him for his role as president of the Delhi and District Cricket Association. While the CM of every state, big and small, pays respect to the finance minister to win financial favours for her/his state, Delhi's CM picks up a fight with the FM! Is this mature leadership? Jaitley is most easily the best performing minister in the Union government. He also has a very clean reputation which could be the result of his being the highest income tax paying politician. He also happens to be the most powerful minister in the Union Cabinet. But Kejriwal deems it fit to engage Jaitley in a personal battle without any apparent reason. His quixotic waywardness doesn't end with Jaitley. Often he takes on Narendra Modi, the most popular leader in the country today. And he does it not for a greater share of taxes or more autonomy for Delhi; he attacks Modi over his educational degrees. When Delhi was fighting dengue, the CM was fighting to damage his political opponents' personal reputation. Kejriwal was chosen to become the most successful chief minister of Delhi. Last month, he tried to become the chief minister of Punjab and failed. But that seems to have given him another entity to fight with -- the Election Commission of India. Even Raj Narain, who defeated Indira Gandhi in the 1977 Lok Sabha election, dispensed with a part of his activist mindset after he was appointed health minister in Morarji Desai's Janata Party government. Kejriwal seems to have no such plans. He fought his way to office and may like to go out fighting too. In the process of fighting one and all, he is failing to perform the prime duty he was elected to perform. He is not taking his blueprint of a better Delhi to the actualisation phase. He was not elected to use public money for AAP advertisements nor was he mandated to enrich an already wealthy lawyer by seeking to pay his fees from the Delhi exchequer. I want to make a larger point here. If Delhi's CM has to perform like a CEO, then he has to show leadership qualities and deal with friends and adversaries in a mature manner. He cannot appoint a colleague's daughter as a consultant without following a recruitment process nor should he refer to captains of the industry in a derogatory and demeaning manner. 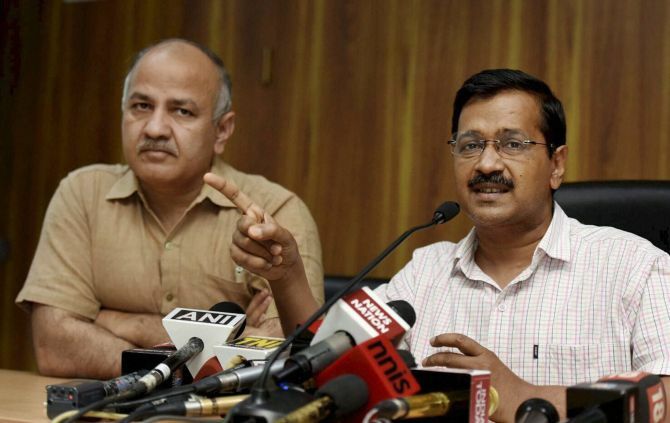 Should the state of Delhi suffer due to its chief minister's idiosyncrasies? That would be a gross injustice to the city's people. Maybe Kejriwal should just pass the mantle of chief minister to his deputy Manish Sisodia. The mild-mannered Sisodia has patience and the good sense of working with an lieutenant governor who may not be his friend and a PM who is definitely not a foe of the citizens of Delhi. Sisodia has worked under Kejriwal's shadow for long, but his performance as education minister has been noteworthy. He enjoys the respect of a majority of his fellow ministers; even the MLAs have confidence in him. Sisodia's elevation as Delhi CM would set Kejriwal free and he could even take up a significant role in national politics. He will be free from the shackles of his bungalow and car and can return to activism while remaining an MLA. The role of activists in any society is important. And there is none bigger than Arvind Kejriwal in the revered space of activism. Kejriwal is missing that space and the space too seems to long for him. Let it get back its soul. Why is Kejriwal tweeting so much about Modi?